Faculty at Morehouse College have objected to a leader of the storied historically black university in Georgia. A quorum of faculty members voted no confidence last week in the chairman of the board of trustees, Robert C. Davidson, Jr.
Davidson could not immediately be reached for comment Monday night. Ulrica Wilson, a professor of mathematics, said Monday evening that the faculty would be issuing a joint statement soon. The vote came at a particularly fraught time for such institutions, after an early outreach by the new Trump administration and Republican leaders to historically black colleges across the country, an effort that was welcomed by some and questioned by others. Earlier this month, after leaders of historically black colleges met with President Trump at the White House, John Silvanus Wilson Jr., the president of Morehouse, issued a frank statement expressing his disappointment with the substance of the meeting. He said that rather than a pledge of a significant funding boost, and despite talk of additional money from federal agencies, a special innovation fund, large boosts to Pell Grant and other funding, the main change announced was a symbolic shift of the initiative on historically black colleges from the Education Department to the White House. He said he believes DeVos is well-meaning and ended with hope for true support from the new administration. Last week, the faculty at Morehouse College handed down a vote of no confidence in the chair of the Board of Trustees of the college. They think that the board chair Robert Davidson has too much control, is ignoring key voices, and is meddling in the day-to-day activities of the institution in a way that by-passes the role of President John Wilson. Overall, the Morehouse faculty has been satisfied with President Wilson’s leadership and wants to give him a chance to lead. Overall, the Morehouse faculty is not satisfied with board chair Davidson’s leadership of the board. Overall, the Morehouse faculty is not satisfied with the way student and faculty trustees were treated by board chair Davidson — being asked to leave when a vote about the president’s contract renewal took place. Overall, the Morehouse faculty is not satisfied with the way board chair Davidson responded to an Association of Governing Board’s (AGB) consulting report calling for the college to have fewer Morehouse alumni on their board, to dismantle an insider group on the board of trustees and to work on establishing a healthy relationship with President Wilson. Overall, the Morehouse faculty believes that President Wilson is committed to working with board chair Davidson as demonstrated by Wilson’s letter to the board chair asking to address the AGB recommendations and to work “side by side” with Davidson for the good of Morehouse. Overall, the Morehouse faculty is not satisfied with board chair Davidson’s decision to issue a letter to the Morehouse community, relieving President Wilson of his day-to-day duties at the institution. Davidson’s letter has since been corrected. After following what is happening at Morehouse College for the past three years, I am led to believe that board chair Davidson and several other members of the board do not fully understand their role, or have decided to overstep it. Yes, boards of trustees hire and fire presidents, however, once a president is hired, boards need to step back and let presidents lead institutions unless there are substantive and damaging issues. Boards of trustees set overall college policy with the input of the president, promote the college, raise money for the college, empower the president of the college, and, first and foremost, they hold steadfast to the mission of the institution. In the case of Morehouse College, the mission is to educate and empower African-American men. Unfortunately, students (and the faculty that serve them) are being left out of conversations and their needs are being ignored by the board of trustees at Morehouse College. Morehouse is a storied institution with a strong history and reputation, but the reputation is being damaged by in-fighting among various college constituent groups and factions among the alumni. For the sake of students, all groups must put students first rather than their own agendas. We have seen similar situations play out at Florida A&M University (Elmira Magnum) and Alabama State University (Gwendolyn Boyd) in the past year, and talented leaders lose their contracts to lead. Of note, Presidents Wilson, Mangum and Boyd had very successful and uneventful careers at universities — including MIT, Cornell, University of North Carolina, Chapel Hill, Johns Hopkins University — before leading the historically black colleges and universities (HBCUs) that didn’t renew their contracts. The sullied relationships between boards and presidents must improve to sustain historically black colleges and empower African-American students. Given the state of the United States and the uncertainty of funding in higher education overall, it is imperative that historically black colleges have stable, talented leaders who are empowered and trusted to do their jobs. If this doesn’t happen, HBCUs will find themselves without leadership, without faculty, and without students. As someone who currently serves on an HBCU board, and has served on another in the past, I know that board members must ask themselves why they are serving, and if the reason is not connected to the welfare of students, and the overall benefit of the institution, they must resign. I also know that it is important to listen to the Morehouse faculty and their vote of no confidence in board chair Davidson. If there is one thing I am sure of after 23 years of doing research related to historically black colleges, interviewing thousands of HBCU faculty members and students, and spending time on 101 of the 105 campuses, it is that their faculty members care about students. 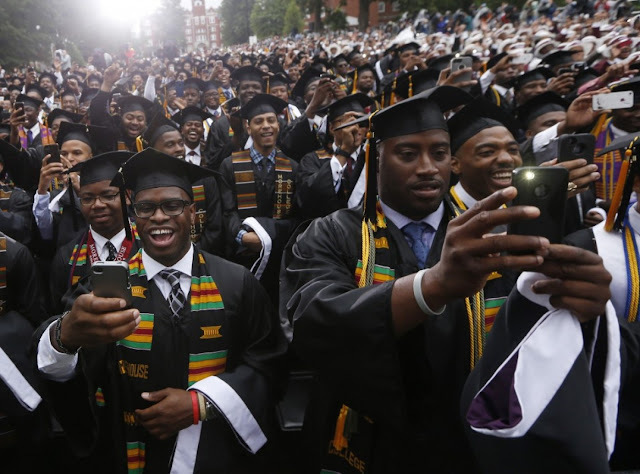 Historically black colleges are vitally important to the nation and the future of African-American communities. They need selfless board members who, like the faculty, are focused on the success of African-American students above all else. Feeling optimistic and rejuvenated after meeting with the Knoxville College Board of Trustees on March 17-18, Mayor Johnny Ford of Tuskegee, Alabama, Judy Tolbert, who attended KC as an exchange student from Macalester College in St Paul, Minnesota, in 1964, both board members, and I as the college historian took a stroll around the campus to reminisce about the days when the school was vibrant. As we completed our walk, we met four Unicoi County High School students from Erwin, Tennessee. We introduced ourselves and asked why they were there. They replied that they were working on a term paper and had chosen to write on the failing structures of the college. After they took pictures with us, Judy told them, "Remember to say that we are the Phoenix about to rise from the ashes." For the first time in years those words had a ring of truth for me. I watched as we lost our accreditation and the student body dwindled. I despaired in seeing the buildings crumble from lack of maintenance. I agonized in frustration as vandals looted, broke windows, stole plumbing fixtures and destroyed historic property that has been a part of Knoxville for the better part of 150 years. I knew where the blame lay but didn't see any use in pointing fingers. I had hopes that KC would rise again with good leadership and the support of the community. On two occasions I was in conference with committees of the Board of Trustees and was invited to participate in the board retreat. They understand how we got into the current mess and have taken major steps to get out of it. They expect to begin operations with a renewed certification from the Tennessee Higher Education Commission in a matter of weeks. They have appropriated funds to hire an administrator and others. The education wing of the campus church has been renovated for administrative offices, classrooms and spaces for meetings. They intend to lease the 104-year-old church. They have hired a reputable company to provide campus security. I watched as a new roof was put on the library and heard the board authorize funds to re-roof the campus church and paint its columns at the entrance of the campus. The board is in talks with the city on a joint effort to re-purpose school property for benefit of the community. There are talks with county government for an even greater joint project to benefit KC students and the community. There are negotiations with private companies for use of other campus tracts as well as a move to develop affordable housing in the old faculty building and adjacent sites. The board has developed committees for better oversight of the school. They understand that trust, transparency and financial responsibility are paramount in revitalizing Knoxville College. The Temple College Board of Trustees approved the college campus carry policy at its Monday meeting after holding a community forum earlier in the day and attended by a few staff members, instructors, trustees and administrators. In all, TC held at least four campus carry forums during the 2016 spring and fall semesters for students and staff. Glenda Barron, TC president, said she wanted the taxpayers who support TC with their dollars to have input on the policy, or at least become familiar with it. Senate Bill 1 allows for carrying a concealed handgun on Texas college campuses and was passed during the 84th Texas legislative session. It went into effect on Aug. 1 2016, at four-year colleges and universities. Community colleges will put the law into practice on Aug. 1, 2017. As it stands now, the policy prohibits weapons on sites of TC sporting events, in the testing center, or in the board room when meetings are being held. The East Williamson County Higher Education Center in Hutto currently allows concealed handguns because the building is owned by TSTC. Texas State Technical Center falls under the four-year university designation which allowed for concealed carry starting in August 2016. The TC sites in Taylor and the Texas Bioscience Institute on Scott & White West Campus will follow the stipulations of the buildings’ owners. Taylor ISD and Baylor Scott & White. On Monday, the board approved the appointment of Dr. Alejandro C. Arroliga, physician and administrator, to the board of trustees. Arroliga is taking the place of Michelle DiGaetano, who left the board when she moved from the TC taxing district. Arroliga will serve on the board until May 2018 at which time he can seek re-election. Arroliga is a renowned pulmonary and critical care medicine specialist who served as chairman of the Scott & White Clinic Board of Directors and is chief of staff of Scott & White Medical Center – Temple. Arroliga earned his medical degree with honors from Veracruzana University in Veracruz, Mexico. He completed a pulmonary and critical care fellowship at Yale School of Medicine and joined Texas A&M Health Science Center College of Medicine faculty and Scott & White medical staff in 2006. 0 Response to "At Morehouse: When college boards of trustees won’t let presidents do their jobs"